Graphs and Properties of the Sine and Cosine Part 1 Period and Amplitude. 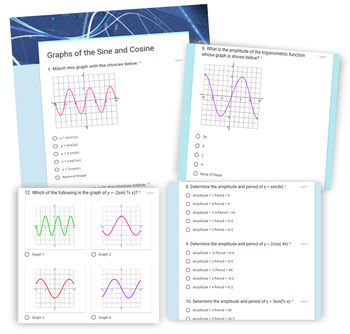 Assessing your students' understanding of the Graphs and Properties of the Sine and Cosine functions has never been easier. 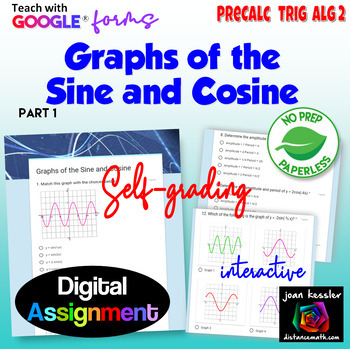 This digital resource which can be used as an Quiz, HW, or Paperless assignment is designed with Google Forms™ which means it is NO PREP for you. There are 12 questions which will be graded automatically for you. Students will be assessed on Amplitude and Period. The resource does not contain phase shift or vertical shift. Please see link below for the resource which also includes those topics. 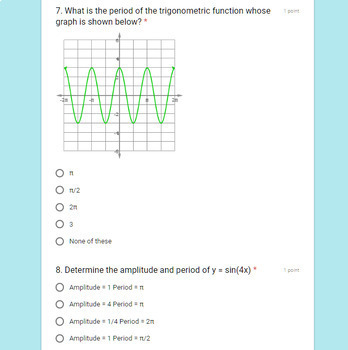 Questions include matching graphs to equations, equations to graphs, and determining amplitude and period from equations. The questions are in multiple choice format. After opening the link in the downloaded PDF, all you have to do is send your students the form. After they submit their answers you will not only have their grades and responses, but will be able to see a question by question analysis for your class. With the new Google Forms, teachers have access to real-time data that is organized into colorful charts and graphs. You will be able to see what students know and don't know. Your students get immediate feedback, also. 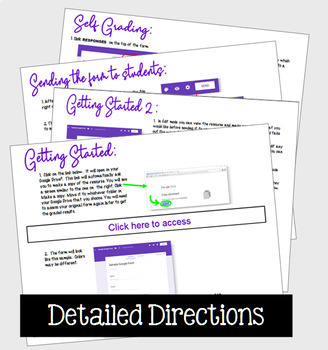 Since Google Forms are editable, you can add, delete, or edit questions, or change the points values. Illustrated directions for editing are included. Your download includes access to the resource, answers, and detailed illustrated directions. ©2018 Joan Kessler (distancemath.com™). Please note - this resource is for use by one teacher only. Colleagues must purchase additional licenses or you may purchase licenses for them at a discount. Note: You may not upload this resource to the Internet in any form.